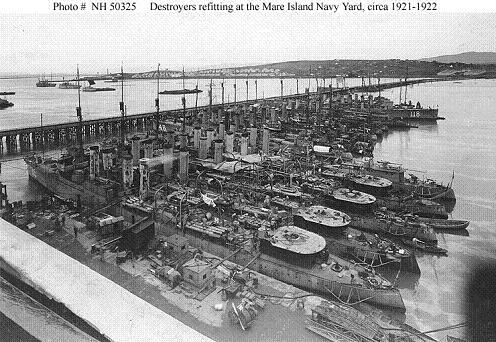 Mare Island (122.255W 38.073N) was the U.S. Navy’s largest construction yard on the West Coast, having been established in 1854 across the Napa River from the city of Vallejo. It was here that the battleship California was laid down between the world wars. By the start of the Pacific War, the base had thee drydocks and two shipbuilding ways, and by 1945 this had expanded to four drydocks and eight ways. However, the base suffered from heavy silting, and it was normally used only by ships of cruiser size or smaller. A number of auxiliaries and older submarines and destroyers were here when war broke.